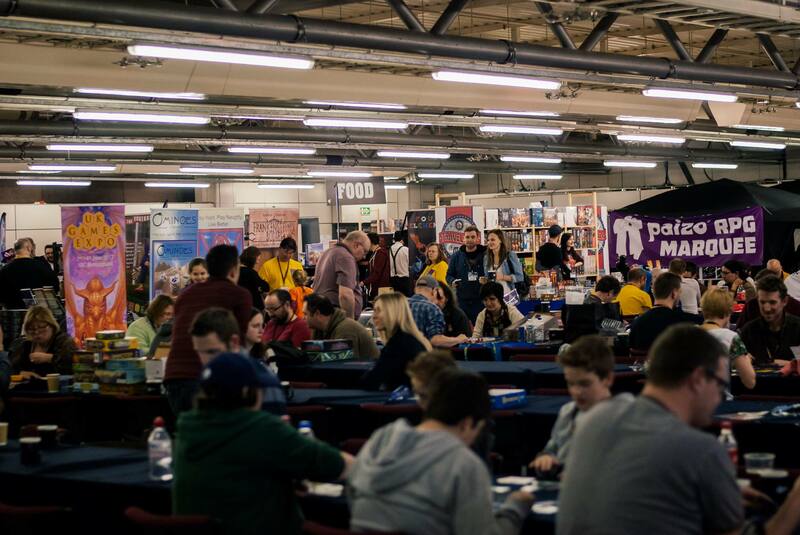 In the last decade, Birmingham’s UK Games Expo has cemented its place as the UK’s largest board game convention. It is now a genuine mark on the global gaming convention map, with the cream of publishers (as well as the biggest tournaments) in attendance. But with this success have come the inevitable problems of growth. Reasonably priced hotels near the NEC were snapped up a year in advance, leaving ridiculously priced options or a commute as the only options – not great when the trains into the city stop running early and cabs cost a fortune. And both of the last two years have seen times when the open gaming space was full. So despite its clear success (I’ll certainly be attending again this year), it shows there is room in the market for more such events. With the Midlands well catered for, up has stepped Tabletop Gaming Live (London in September) in the South, and AireCon (Harrogate in March) in the North – with AireCon being sponsored by UK Games Expo itself (amongst others). While this will officially be the fifth AireCon, it became an annual event last year when it moved to its current home in the Harrogate Convention Centre. It describes itself as a “friendly and inclusive analog gaming festival” and has secured sponsorship from one of the worlds most respected games publishers, Czech Games Edition (CGE). Better still, there will be a 350-game library courtesy of FLG Travelling Man, which has stores in Leeds, York, Newcastle and Manchester. There’s plenty to recommend AireCon. Firstly its in Harrogate, which is lovely (in stark comparison to London and Birmingham…). Second, it’s in a great modern venue and is currently a small but perfectly formed version of Expo (they’re expecting 1,000 unique visitors over the weekend) – plenty of open gaming space, plus a bit of retail therapy to demo and buy new games (there are more than 25 exhibitors confirmed, including Asmodee and the Ragnar Brothers). The organisers provide a fun, relaxed environment and welcome all (respectful and not smelly) gamers from across the various strands of the hobby. Alongside the kind of tabletop games I talk about here, you’ll find plenty of opportunities to try RPGs – as well as gaming industry panels, quizzes, a play-test area for unpublished games, contests, a family area and giant versions of some of your favourite games. Plus there’s the Super Board team competition – with a 1st prize including tickets and flights to Essen 2018! AireCon is smack-bang in the middle of the town and easily accessible by road or rail. It’s spread over three days (March 9-11) and tickets are just £25 (£12 kids) for the weekend, or £10 (£5 kids) for a day if you just want to test the water. Those of us travelling from around the rest of the planet have plenty of nice hotels and B&Bs to choose from (it’s a pretty big tourist town), and I’m really looking forward to it. You can find all the nitty gritty details in their official FAQ here. This entry was posted in Board games, Games, Travel by Chris Marling. Bookmark the permalink.